The following is a guest post by Betsy Fallwell. If interested in submitting a guest post, please read my guest posting policy and then contact me. I’ll admit that sometimes I look at our life insurance payment each month as a waste. However, life insurance does play a critical role in many financial game plans, especially for young families. So, how can we minimize our life insurance costs without compromising its crucial function? 1) Buy only the amount of coverage you need. You aren’t trying to win the lottery in the event that you or your significant other dies unexpectedly. Your goal is to cover existing expenses and maintain your current lifestyle. Use this life insurance calculator to determine how much you need. By purchasing the correct amount of coverage, you can ensure that your family is protected without unnecessarily high monthly premiums. If you are single and have coverage through your employer, you may not need to purchase any additional coverage. If you are the primary breadwinner and have several children, you could easily need coverage in excess of one million dollars. 2) Buy term insurance only. This is what will have the most impact on your bill. Whole life insurance, the alternative to term, is 10-15 times more expensive. Whole life blends savings (with a poor return rate) and insurance into one monthly premium. Bloated fees, administration costs and commissions are hallmarks of whole life policies. Buy term insurance only and invest the difference between the term and whole life premiums. Use this term versus whole life calculator to see the full impact of this decision. 3) Buy only for the period of time when you will need coverage. Once you no longer have financial liabilities like a mortgage, college tuition or children living at home, you no longer need coverage. When you buy, make sure you have a good grasp of when these important milestones occur so that you don’t buy a 30 year policy when you only need 20 years. 4) Price compare, as you would with any other product. Get the best rate possible for you. Also, make sure to purchase from a strong company (“A” grade or better) as rated by any of the three major rating agencies (AM Best, Fitch or Moody’s). If you have to re-buy later in life because your insurance company went bankrupt, it will be much more costly. 5) Don’t delay. Buy life insurance as soon as you realize your need. The younger you are when you purchase your policy, the cheaper it will be. 6) Make healthy choices in life. That’s right, stop smoking. Life insurance is much more expensive for smokers. Also, if you make major positive health changes like losing a significant amount of weight, lowering your cholesterol or no longer smoking, you might be able to re-buy insurance at a cheaper rate, despite being older. 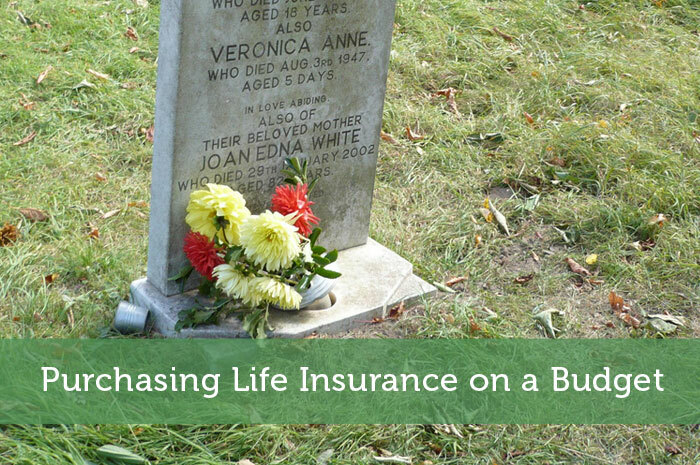 There can be a very emotional aspect to life insurance, since you are processing what life will look like if you or your loved one died unexpectedly. Stick with these tips and make an informed, intellectual decision to protect yourself and your family without bursting your budget. Author Bio: Jon Emge is a Senior Advisor and Content Manager, originally from America who moved to Liverpool because of his love for the beatles. He is a published author and has assisted and advised clients on personal finance. In his spare time he enjoys listening to music, going to the odd festival and practicing his poetry skills! These are all great tips Amber! I am an investment adviser and insurance agent, and these are great points people need to consider when shopping for life insurance. Finding an insurance broker or shopping the quotes around yourself is EXTREMELY important; knowing the “proper” amount of insurance and how many years you want is as well; and being healthy certainly lowers your cost – especially if you look at how much you’ll spend on it over a 20-30 year period. I wonder how many people make the mistake of just going with the first insurance company they talk to. Chances are they are not getting the best rate and coverage. I imagine a lot of people also overestimate the amount of coverage that is really sufficient. Great post. Life insurance is something a lot of us don’t like to think about. But if you have kids or other dependents, it’s crucial to have at least a basic level of life insurance. These are some good points to think about. Well then I guess I can continue to ignore since I don’t have dependents or kids. All I’ve got is my 2 cats, and I’m doubtful that I could name these my insurance beneficiaries lol. I know people leave inheritances to animals, but I’m sure an insurance company would prefer the money going to a person that they can try to screw over. Great tips. We bought term life insurance when we bought our house. Later on in life when we have more assets and equity we plan on not having it. Yes I guess when you have sufficient assets, there is not much point in continuing to dump money into life insurance. The assets should be able to hold the other person over if you die before them. i had a whole life insurance policy for a couple of years, until i ran the numbers on whole vs. term.. at that point, i immediately cancelled my whole policy and switched to term. for half the price, i got over 20 times the death benefit! Wow that is quite a difference. You must’ve been quite surprised when you crunched those numbers. It must’ve made for an easy decision to switch. Now that the boyfriend and I are buying a house, life insurance is definitely something I need to get. The bf already has a policy and I’m planning on getting one. It’s something you never want to think about, but if one of us passed the other would certainly appreciate the security of not worrying about finances during such a difficult time. We also need to write wills…maybe a post about that is coming next Jeremy? Yes as you’re committing to a mortgage, life insurance probably would be a good idea. Then if something happens, he wouldn’t be forced to suddenly move out of that new house. Yes a post about writing a will may be in the future, but I’d probably have to get a guest writer to cover a topic like that. Maybe it’s best to wait a bit though to space out the somber posts. Jeremy, thanks for sharing a post on such an important topic. I would agree to get an insurance cover for only according to your need. To calculate it one must know the key expenses of his dependents. Properly calculating expenses is important to ensure you are not getting more coverage than you actually need. When on a budget, you don’t want to be treating insurance like a lottery. Some good tips! I definitely agree with buying it NOW (while you’re still younger and healthier) as well as going after Term (we just spent a whole two posts debating this on my blog this week). I do politely disagree with Number 3. Although everyone’s needs will be different, I would suggest buying the 30 year term whenever possible if you can afford it. The reason I suggest this is because usually the cost difference between a shorter period and the 30 year is often negligible and because it is a good safety net in case you end up working longer into life than you expect. Plus, when you get older, things will happen to your health you won’t expect. If you had bought a shorter term, you may not get re-approved or end up paying A LOT more than you use to. Buying the 30 year policy is almost as good as getting the permanent policy, but at a fraction of the price. Thanks for your comments. A couple of thoughts: The older you are, the more the cost difference between the 20 and 30 year will be magnified and it may not be a negligible difference (of course, that depends on your monthly budget too). Also, the underlying safety buffer as you get older though is your own savings, not the extra life insurance. If you’ve been investing consistently, you get to the point of being self insured. Some people need the 30 year policy to get there; others only need the 20 year policy. The great thing though is that you can “run the numbers” (conservatively too) and see at what point your own investments grow to the point of negating the need for life insurance. The goal is not to have coverage as long as you are working, in my mind, but as long as it is a necessary element to provide for your family in the event of an early death. If someone wants to work until they are 70 years old, that doesn’t necessitate coverage in and of itself. Coverage is necessary until there is a pile of cash big enough that, when invested, will generate enough return to cover existing obligations. Thanks for taking the time to respond. Thank you for replying to that point Amber. I admit that I don’t know enough about life insurance to know when to go for longer term. It does seem to make sense to stop paying for life insurance when you have enough saved up to cover any future expenses yourself. I always think of life insurance as one of the ‘unselfish’ kinds. The person who dies gets nothing out of it, apart from the knowledge that he can have peace of mind knowing he has provided for his family. And who can place a monetary value on that? True. It’s difficult at times to part with the monthly premium, but the value of caring for your family if something happens unexpected is priceless. I would be satisfying knowing that you loved ones will be taken care of. Of course if you’ve built up other assets, you can be comforted by the thought that they can use those assets to get by. Two points. 1) IF you are young, and it seems it is suggested that people buy Life Insurance while they are young here, I would say to go for the longest term you can afford, preferably 30 years. Why? You can calculate when you think you will be financially independent, but that requires making assumptions. What will your return be in the future? What is inflation? What lifestyle will you enjoy in the future? etc. And remember, Inflation will erode the spending power of the benefit and will also make the payment less significant in the future. I would also advise to calculate the benefit amount based on your current portfolio and spending, not your salary. And be realistic about what is needed. Have young kids? Do you want them to go to college? Will your spouse move to a more affordable home if you die (we can buy a nice home in our area for cash, but choose to live in a nicer neighborhood)? Are you married couple with no kids and can your spouse work? It’s a tough world out there, I wouldn’t buy insurance for them (and I didn’t). Once you calculate your needs, what can be covered by your assets and Spouse, then I say add another huge wad to it. Life Insurance is cheap. And there are a lot of unknowns ahead. A quick look at prices for a 30 yr old healthy male for 30 year term in my area has a $500k benefit @ $400/yr premium, $1MM benefit @ $730/yr premium and $2MM benefit @ $1360/yr premium. All A+ rated companies. Seems pretty affordable, I don’t know why you would cheap out on it. Thanks for commenting. I would agree that expenses are the key to sizing the policy, not salary. I also agree that in a case where you have a couple with no children, the surviving spouse (if able to work) is more than covered by the typical “2.5 times your salary” coverage that is common as a workplace benefit. It seems counter intuitive, but buying a bigger policy does not make you safer. Once your expenses are covered – and again, they can be calculated conservatively – they are covered. Doubling the death benefit doesn’t cover your necessities more. At that point it is a “lottery jackpot.” You aren’t providing for needs, but facilitating additional luxuries, which isn’t the goal of life insurance in my mind. Once you have enough of a benefit to sustain your obligations like a mortgage, college tuition and monthly expenses, then adding on top of that is wasteful, in my opinion. Take the difference between the 500k policy and the other ones in your example and invest it. You are then building your own wealth. It is yours whether or not the insured individual dies. That also gives you some of the buffer you desire. The reason that life insurance is cheap, as you point out, is that it is a good bet for the insurance company! The odds of you dying early are low. So, we should all certainly prepare for the worst (e.g. buy life insurance) but gear our overall plan around what is most likely (e.g. not dying in that 20 or 30 year window). One limiting factor in what you propose is that the extra $80 per month to get to the 2 million dollar policy is a lot for some families. I know many who are fighting to save a few hundred per month. $80 is a large percentage of that to spend on coverage that is just bonus beyond what needs truly exist. We are not advocating being cheap, but conservatively calculating what you need and just getting that amount of coverage. “Leftover” money is then invested and you get to keep that, of course, regardless of an early death or not. You seem to be twisting my words, as I in no way suggested to calculate what size benefit one would need and then double it. If I gave that impression through the premium costs I cited, I apologize. Those numbers were just to show how affordable life insurance is, not advocating the amount any one person should buy. Would I suggest to someone making $40k/yr to buy a $2MM policy? Most likely, I wouldn’t suggest it, but they are certainly free to do so. My point is, that life can, and will, throw many twists and turns at a person. What if a family member gets sick and there are huge medical bills? What if you are planning on your spouse working and they can’t work because of a disability? What if your parents need financial support from you, do you let them eat cat food? What if you have a wild child (like I was for my parents) and you have to bail them out of jail, pay for lawyers? etc, etc. These certainly are hard things to comprehend until we, or someone we are close with, experiences them. Thanks for your continued input. I quite enjoyed the Mike Tyson quote. I do think there should be buffer, like you. Perhaps we just guage the size of it a little bit differently. (I understand your point more clearly now that you are not advocating a doubling or quadrupling of a calculated amount). I agree that the unexpected can happen and that having a full set of insurance protection including medical, disability and life is important. If someone has 3-6 months expenses in an emergency fund, is regularly saving, has life, medical and disability insurance, that’s probably as protected as they can get. Great article! It’s so important to have adequate coverage for your specific needs. Using a life insurance calculator is a great jumping off point to determining how much coverage you need for your income; but don’t stop there. Make sure you take it a step further and speak to a licensed agent for an accurate rate. As an employee of AccuQuote Life Insurance, we are very against group/work life insurance because that coverage can be lost if you quit, get fired or your employer stops offering it. You’re definitely right about when to buy it; the younger you are, the better your rates will be. Thanks for the input Alexa. You’re right that you should actually speak with an insurance agent for a quote. The online calculators are good for a rough estimate, but that won’t necessarily be the same as what insurance companies can actually offer. Does a single renter without dependents need life insurance, too? From what I’ve been reading it sounds like it’s not really necessary in that case. I’m back in that situation and I don’t intend to get life insurance anytime soon. If something were to happen to me, I’m sure my retirement savings and car resale value will cover any funeral costs. So many myths and opinions on the subject of life insurance. It seems the tendency is to apply blanket theories to the question of how much and what type, when in fact different people have different needs and there are different types of products to handle those needs. The bottom line is, regardless of your “status” in life, if in the event of your leaving this earth there is someone else that would incur a negative financial consequence, life insurance is the tool that can eliminate that negative consequence, so matter how big or small it is. I don’t agree that there is always a negative financial consequence. People often have enough money in savings and other assets to easily cover any financial obligations left behind. With that in mind I won’t be getting life insurance until I have kids. Ironically that line of yours is one of those blanket statements that doesn’t apply to everyone. Jeremy…read that “line” again. Nowhere am I saying there is ALWAYS a negative financial consequence and in my “blanket” statement I am saying IF someone’s departure does cause a negative financial consequence life insurance is a good tool to use.